Tattoo artist Jason Kundell may hail from the Pacific Northwest, but his design style is inspired by a place halfway around the world -- the Far East. Though Kundell, owner of Art Work Rebels tattoo shop in Portland, Oregon, grew up in the LA suburbs, since getting hooked on ink as a skateboarding teenager, he’s been obsessed with Japanese-style tattooing. He’s lived in Portland since 2009, and like most Portlandians, spends much of his free time out in nature. So when Bulleit approached Kundell to create a design to represent his city for a new limited collection of tattooed Bulleit Bourbon bottles, he again turned to the great outdoors for inspiration. 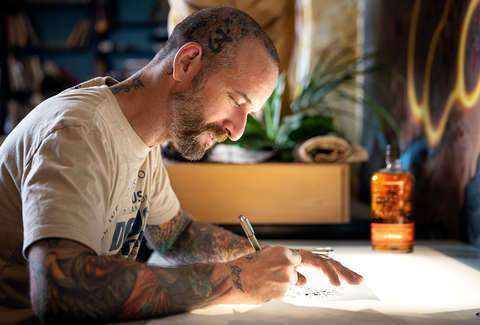 “I wanted to do something nature-esque that epitomized Portland and was taking a couple of my favorite Japanese subject motifs that would fit Portland,” says Kundell, who is one of four top tattoo artists that the whiskey brand partnered with for the city-inspired collection. His resulting Bulleit bottle design is modeled after Japanese woodblock prints of the mid- to late-1800s. It features a fox (in Japan known as a kitsune, and a common subject of Japanese folklore) with a snake wrapped around it, and peonies (spring flowers that are prevalent in both Oregon and Japan), all framed by clouds and a silhouette of Oregon’s Mount Hood -- reminiscent of Japan’s Mount Fuji in the background of so much Japanese artwork. The collectible tattoo bottles, including Kundell’s fox and snake design, are available for purchase in each artist’s respective state -- Oregon, California, Texas, and New York -- and select bottles will be available nationwide. 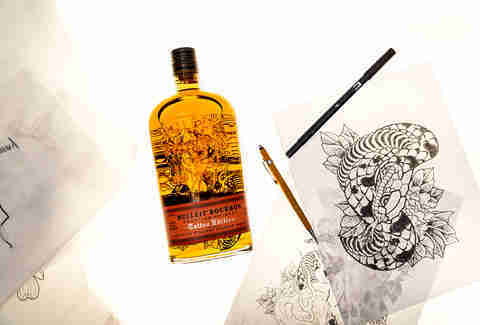 Though the Tattoo Edition marks the first time that Bulleit’s iconic bottle has been altered, it actually proved less stressful to Kundell than inking a person. Creating his personalized bottle also meant a rare act of working with digital tools. While Kundell sees tattooing blending more with graphic arts as the next frontier of the industry -- “There are a lot more tattooers using iPads and things like that” -- that’s not his style. As is fitting with Portland’s quirky vibe, DIY mentality, and love of organic living, Kundell likes to describe his tattooing as “authentically artisanal” (only slightly tongue-in-cheek). Please Drink Responsibly. BULLEIT Kentucky Straight Bourbon Whiskey. 45% Alc/Vol. The Bulleit Distilling Co., Louisville, KY.